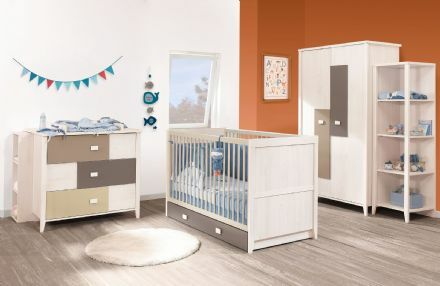 Stylish and contemporary with clean lines Naturela childrens furniture is finished in a very tasteful hazelnut oak effect. The drawer and door fronts have chic black grooves on the fronts to give an outstanding look to the furniture. Gami Naturela is robust and built to last coming with a 3 year Guarantee. We do offer an assembly service as an added option. 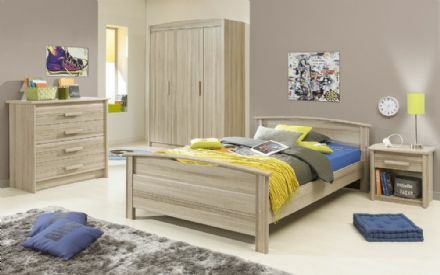 Gami Naturela Day Bed, Chest of Drawers, Side Table and Wardrobe Package is highly popular as having lots of storage to keep the room tidy and a wonderful desk for your child to do their homework. Decorative in a chic hazelnut oak finish with black grooves on the drawer fronts to give a high quality feature to their bedroom. A unique and contemporary roomset in a stunning Charcoal Oak finish. The set comprises of a continental Single bed, Bedside and Desk. Beautiful, solid and sturdy furniture from French manufacturer's, Gami. 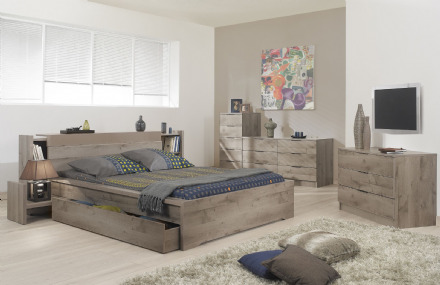 A striking single bedroom set finished in a stylish Grey Oak effect foil. Beautifully shaped head and foot board for a naturally stylish room and a useful underbed drawer is available for extra storage. Make the most of your space with our pre selected ranges of bedroom furniture sets at designer home and garden. Browse wardrobes and drawer chests in various styles and finishes.